Cases of exsection of diseased bone for caries. Journal : The Western Lancet ; vol. v.
San Francisco : Cubery & Company, 1876. Description : [1 l.] pl., -534 p. ; ill.: 1 phot. ; 23 cm. Photograph : albumen mounted on printed leaf. Subject : Long bones & joints — Osteomyelitis ; excision. Author caption: BY H. H. TOLAND, M. D., PROFESSOR OF SURGERY IN THE MEDICAL DEPARTMENT OF THE UNIVERSITY OF CALIFORNIA. Photo caption: Photograph to Dr. Toland's Case of Exsection of Tibia and Fibula. The photographic subject is identified as Michael Lawton, a young man who fell from a cart and injured his ankle. A surgeon was summoned and amputation was advised, but refused. 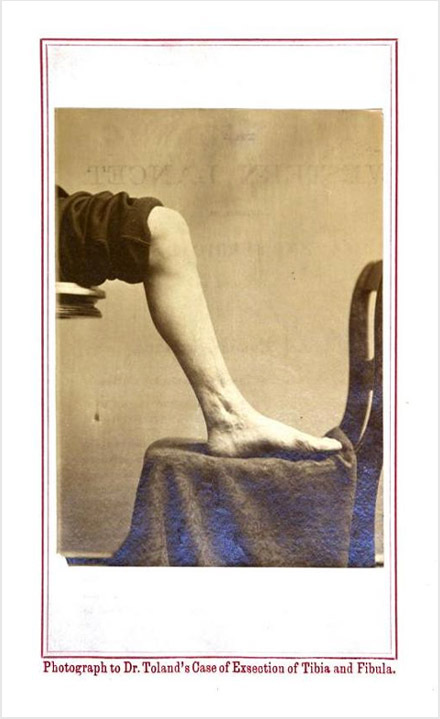 When Toland received the case, the leg was carious and he sectioned two inches from the lower extremities of both the tibia and fibula — later taking a picture of the very satisfying results. Three additional cases of bone caries are discussed.